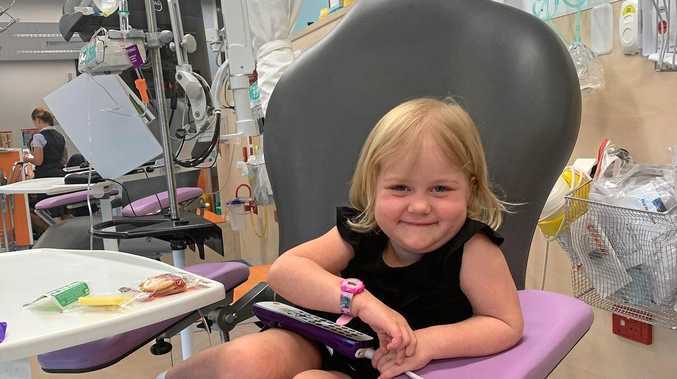 BRAVE GIRL: Three-year-old Haylen Ernst is fighting cancer, since being diagnosed in January she hasn't returned home. A treasure hunt will be held in her honour next weekend. EVERY mother's nightmare is just a normal day for Lockyer Valley born Tiffany Ernst. For the last two months she has sat beside her three-year-old daughter Haylen as she undergoes cancer treatment at Queensland Children's Hospital. Since January 15, Haylen's tiny body has endured a lumbar puncture, bone marrow aspiration, picc line insertion, chemo therapy, along with other drugs administered daily. Mrs Ernst said the process was unimaginable, but it was the new norm for her young daughter. "For the first little while you feel numb but after the numbness wore off you were like this is our new normal," Mrs Ernst said. "Life won't be the same as what it was before." Worrying about germs and Haylen's temperature is just one of their new habits Mrs Ernst will practice for the next 2.5 years during treatment. Haylen's bravery has overwhelmed Mrs Ernst, she said her daughter who always asked why, has just accepted all challenges in her way. "She's coping better than us as parents, she doesn't say much but I guess she's taking it all in," Mrs Ernst said. Haylen's biggest form of communication is through her teddy bear Orlando, who she explains how she is feeling. "She will express to him and say 'oh Orlando I know you're hurting'," Mrs Ernst said. "She speaks to him and that's how we find out what's happening, she won't actually say 'mum I don't like this', she will just talk to the teddy bear." Since Haylen was diagnosed with acute lymphoblastic leukemia, the mother-daughter duo haven't returned home. Haylen's dad Karl Ernst has been travelling the two-hour Warrego Highway journey between the pair and Haylen's siblings in Toowoomba. While Mrs Ernst said the family operated on a day-by-day basis, she hoped Haylen would be able to return home in between treatments at the end of March. With a high susceptibility to disease, the number for visitors Haylen can have is limited, but her grandmother has found a way for her and the whole community to help. On Sunday, March 31, a treasure hunt will be held in Haylen's honour at Cahill Park. Teams of four are encouraged to follow the clues across Gatton to find treasures and rewards, all while raising money for Haylen.